With today's low-cost digital video cameras, it's easy, cheap, and fun to record your family's special occasions and everyday antics--and keep in touch with those who can't be there to share them with you in person. It's no wonder these tiny cameras are so popular: They retail in the$50-to-$200 range, connect easily to PCs and Macs, and offer endless possibilities. What would the Internet be without its numberless FishCams,GerbilCams, CoffeeCams, and BuildingCams? The world surely is a betterplace now that we can check out 3Com Park or the Kremlin,approximately live, at any hour of the day or night. Web cams make allthis viewing possible, and The Little Web Cam Book explains howyou can contribute to the visual wonders on the Web. The LittleWeb Cam Book provides instruction on setting up your own Web cam,but that isn't as technically difficult as it once was. Now softwareis available that simplifies the installation and configurationprocesses. Author Elisabeth Parker provides all the documentationthe Web publisher needs to publish with ISpy for Windows and SiteCamfor Macintosh. A large portion of The Little Web Cam Bookserves to highlight the creative potential of Web cams by showcasingwhat other cam aficionados have done. You'll find a sizable directoryof online camera sites, plus interviews with the creators of severalfamous cams. Bring the world into your living room! 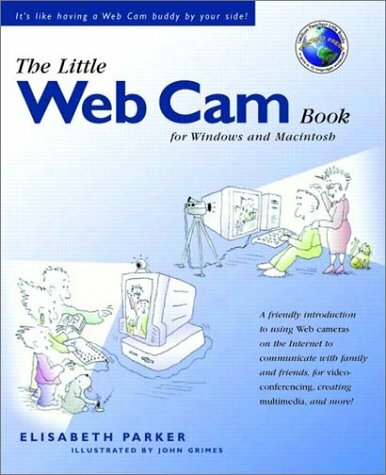 Calling this book "The Little Web Cam Book" is a bit of a misnomer. The book is huge, totaling 356 pages including the index. It is crammed full of useful information, lists of webcam sites, and places where one can download everything you need except a camera. This is a greatbook! Ms Parker's writing style makes it seem like she is right there withyou, explaining each portion. More advanced users will know which parts toskip over, and most chapters stand on their own, so you don't have to readevery word to make sense of later chapters. This was good for me, sinceI was not the least bit interested in reading about the screen savers orhow to make a photo my background. This part seemed to drag out, but thatis from the viewpoint of an expert; if you have never done those things,you might need to spend the time reading about them. For that reason, thebook spends quite a bit on the basics of these ideas. So if you still havethe same background picture on your desktop that came with it, check outthis portion of the book. Other chapters cover tips for setting up thecam and choosing the best spots for broadcasting. If you want to startanother "cat-cam" or other pet-related site, it is worth readingher tips on how to make it exciting for your viewers even when the animalsdon't feel like being photographed. There are also some otherconsiderations you might want to read about before you invite anyone andeveryone into your home or office through a live webcam. Another sectiontells about how to use the still pictures you can capture with a cam tomake GIF animations. This could be for fun, e-mail, or for your web page.The author also goes into creating and editing movies and how to insert GIFanimations and movies into web pages. This could save you from tons ofangry e-mail when your dog refuses to go near the webcam once it's live. There is a chapter on troubleshooting problems and it seems to be rathercomplete. Just about every problem I can imagine occuring is listed herewith possible solutions and resources. I expected a list of other peoplewho have webcam, but a nice feature I didn't expect was interviews withsome of the pioneers and leaders in webcamming. This turned out to be quitea treat. Supplementary information in the book about videoconferencingwas great. I didn't expect to find it here either; the author could havewritten that separately and she and the publisher could have made a lotmore money selling it as another book. They didn't, so I think a "hatsoff" is in order. Thanks! An Excellent Introduction to Webcamming! One of the most popular Internet activities to make a splash on our screens recently has been that of "webcamming." Just about anyone can now set up a suitable camera, including a video camera, and publishnearly real-time audio and video clips online for a variety of purposes forprofit, fun, and pleasure. Elisabeth Parker has written The Little Web CamBook to give members of the online community some real insight into howthey can make creative use of this latest Web craze. Webcamming hasreally taken off during the last two years. Schools, businesses, companies,corporations, and news reporting services have gone online to provide anumber of essential services such as news and weather reporting, onlineeducation, building security, Webcasting, Webconferencing, and themonitoring of children at home and in daycare facilities. Imagine if youwill, being able to log on the Internet and check up on your kids at homeor as they are being cared for by others from the comfort of your office!Other family members will be able to keep in touch hundreds or thousands ofmiles away! Hobbyists have also provided some thoughtful uses as well, suchas wiring homes, offices, and other sites with cameras to provide all sortsof intriguing, but sometimes highly suspect video coverage! Webcamming has certainly made an impact on our society and Elisabeth Parkerwill walk her readers through the steps necessary to give them theopportunity experience this exciting technology firsthand. She makes anumber of solid recommendations for buying cameras, software, and services,helping her readers to make the better choices and help them save time andmoney in the process. Many of the programs she reviews in the book areavailable online for immediate trial use. Buying, installation, anddetailed operating instructions are provided to get readers up and runningin the shortest amount of time. I can hardly wait to join in the funmyself! Parker's instruction, laced with humor, her own personalinterest, and the illustrations of John Grimes makes this book fun,enjoyful, and easy to read. Plenty of creative ideas and resourceinformation is provided - be sure to checkout the list of Webcam siteslocated at the back of the book! This book serves as an excellentintroduction to webcamming and is must reading for anyone interested inlearning about this innovative technology and how it can be put to excitingand productive use!